It is with pleasure that I write this tribute to Gethel VanStavern and share my personal thoughts about her dedication to teaching and her loyalty to Union High School. Mrs. VanStavern was born and raised in Monroe County. She received her B.S degree from West Virginia Tech. and began her teaching career in 1940. 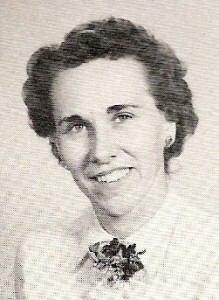 She retired from Union High School in 1978. She continued substitute teaching for several years following her retirement. During her tenure at Union High, she taught accounting, typing, and shorthand; served as the senior yearbook advisor; supervised student staff assigned to the principal’s office, and held the position of Guidance Counselor for approximately ten years at Union High School. I remember Mrs. VanStavern as a fun teacher who brought humor to the classroom and always had a smile for her students. She provided a relaxed and comfortable atmosphere to her classes, allowing students to interact in a positive learning environment. Perhaps her greatest strength was not instilling fear of the teacher, but rather respect for what she was trying to teach and, more importantly, her method and style. It did not surprise me to learn recently, in a conversation with her daughter, Nancy, that she was chosen to serve as the Guidance Counselor for Union High School after I graduated. Who better to assume that role than Gethel VanStavern. I truly enjoyed Mrs. VanStavern’s classes and her personality. I was one of those “student office staffers for the principal’s office” that she supervised. We would type test papers for other teachers and do correspondence for Mr. Allen’s office. At that time, we were typing on manual typewriters, with as many as five carbons, and running stencils on a roller machine that left ink all over us and the papers at times. There were occasions when Mrs. VanStavern had us wear aprons to keep the ink from getting on our clothes, and others times when she would be rubbing our hands, arms and faces trying to remove the ink blotches – we laughed a lot. From her, I learned the basics of typing, shorthand and accounting practices – all of which I later used in different positions throughout my working career for some thirty plus years. I shall always have fond memories of Gethel VanStavern and tremendous respect for her as a person and teacher. My only regret is that I did not tell her this before she passed away in 1991.